We know that your feline friends need TLC as well. 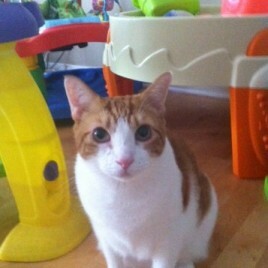 Let our Fantastically Fabulous Kitty Keepers visit with your cat while you are away. Your kitty will enjoy staying in the quiet and familiar comforts of home. We provide a meet-and-greet with you and your cat before you go away to learn your cat's specific needs and learn their normal routine. Our daycare offers large indoor & outdoor play areas, live web-cams, and cozy sleeping cubbies to ensure your dog is happy and healthy. 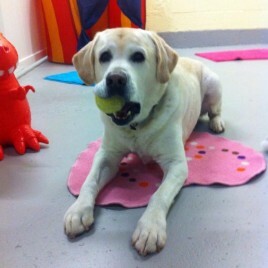 Available for daily daycare fun or slumber party vacation stays, we are happy to have your dog join our furry family. Let us pamper your dog with love and attention while you are away. From daytime walks to overnight stays, we will wear out your energetic four-legged friend so your dog is content and healthy when you arrive home. Baltimore's top pet professional service provider, specializing in dog walking, daycare, grooming, training, home care, & cat care. 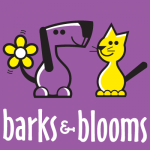 Barks & Blooms™ offers a full range of services to give you peace of mind that your pets, your home, and even your plants are in good hands! Centrally located in the Hampden neighborhood of Baltimore, MD. Insured & bonded. Barks & Blooms™ is award-winning. We know you want the best for your pet! I love the daily report card that keeps me informed of her potty habits and her latest escapades and I love that when I come in the door at night I KNOW she has been exercised and loved because she is so happy. 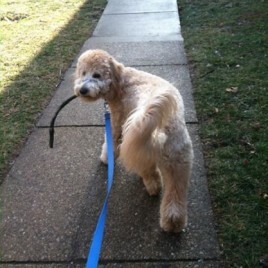 We call our walker Sage's aunt, but she's more like our partner parent. 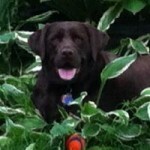 I whole heartedly recommend Barks & Blooms and am happy to answer any questions you have. I know it's a big decision ... but this is one that you won't regret. Thank you so much; you are truly miracle workers. We do not know what we would do without you in our lives. Your flexibility amazes us. My 3 dogs love Barks and Blooms because they (FINALLY) get to stay home and get pampered while we go on vacation! No more boarding, no more begging friends to let them stay in a strange house! You make it so much easier for us leaving Dixie knowing she is in good hands. A simple Thank You is so inadequate. 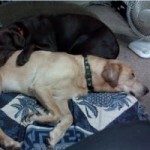 You took care, without grief or planning, of my two babies so I could concentrate on my husband. Next to a fenced in yard, Barks and Blooms is the best friend a dog owner could have. I honestly think Barks and Blooms loves my dogs as much as I do. In 2010, we initially contacted Barks & Blooms to assist us with mid-day walks for our 8 week old puppy until she was potty trained. What we quickly learned is that having a walker gave her much needed exercise and play time, a sense of security and the opportunity to have a potty break in the middle of the day. Four years later we are still using Barks & Blooms because our walker has become an extended family member and brings such joy to our pup. We really appreciate her flexibility with our schedules, her genuine concern for our furchild , her ability to get a very active lab tired, and her enthusiasm. 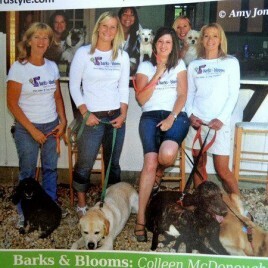 I would whole-heartedly recommend Barks & Blooms based on 4 years of "fantasically fabulous" service. The motto really fits!